You are a donut tasked to do a modern type of town building. The problem is the game did it half-heartedly. For one, there’s no use to making a good layout with the buildings. There’s no combo to building next to each other (similar to other games that has the same theme like Kairosoft games) or how lollipop placement doesn’t seem to affect energy flow too. The gameplay needs a lot of balancing. Using QTE for resource gathering is unnecessary and tedious. The game should let you save in town. There is no reason why this is not possible. The time is so short that exploration is almost impossible. I could’ve sworn I even got attacked twice in such a short time frame so I went back to town with 0 resources. Fighting an enemy and suddenly the village is under attack freezes the game. If you move your castle town building at lvl 3, you cannot put it down again. Rendering you unable to make buildings. Moving buildings is incredibly buggy nor does it have any indicator. There’s a building that you can upgrade infinitely but it doesn’t level up, so it wastes your resources. The hero you get seems to change? It’s confusing! I got a tree and suddenly it’s a red thing. The game needs better visual representation. For example, for the longest time I confused the grass (or are they bushes?) with trees due to their similar colors and look. It’s also hard to figure out what objects are talkable the first time around (ex. cherry, cupcakes, those circle of cookies). This normally isn’t an issue but the problem is it hits exploration majorly which is the game’s core theme. Frustrating experience despite the concept. I wanted to enjoy it. This game was really fun! The town building process was very straightforward and accessible (although other judges had some major bugs with it) and I’m surprised it could be done in RPG Maker. Exploring the world was also a good time, although the button commands could get obnoxious (a more forgiving timing window would be appreciated). Battles were generally good although I never used many of my skills since it just took so long for the required MP to build up. A very engaging game, nice work. Pudding Palace Level 3 upgrade consumes resources, but does not give upgrade. Removing the town hall by canceling a move can prevent the game from finishing, but does not let you know this until later. Glutton legendary hero displays Candy damage type, but does Glutton type damage. Legendary hero sprites are sometimes swapped. There is no advantage to placements so ironically, the best placement ends up being to stuff every non-interactive building at the far edges and build over them as they are maxed in upgrades. 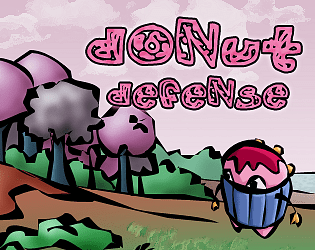 The saves are tedious as you can only save at specific points and you are forced to return to town to fight even if you have 'defenders' in town. In addition, the time passes by absurdly quickly, making it difficult to really explore the map. Due to issues like lag and menu delays, the 'easier' resource gathering actually becomes more difficult than the 'difficult' resource gathering. With the longer resources, you have plenty of time to tap away, but with the shorter ones, you sometimes have no time. The graphics are all custom though there are engine weather effects that kind of stand out a bit in comparison to the very cartoony styled graphics. The mapping is a bit mazey and winding and it can be hard to tell what can and cannot be walked on (some trees for example, you cannot walk over but some forests you can). The writing is informative in nature and the characterisation is okay but nothing amazing. The story is framing for the gameplay and not really deep in any way. The writing itself is okay. The sound is a bit lacking in some areas - a lot more could have been done with it. Same with music which is missing in areas where it really could have been used. What is there fits though. 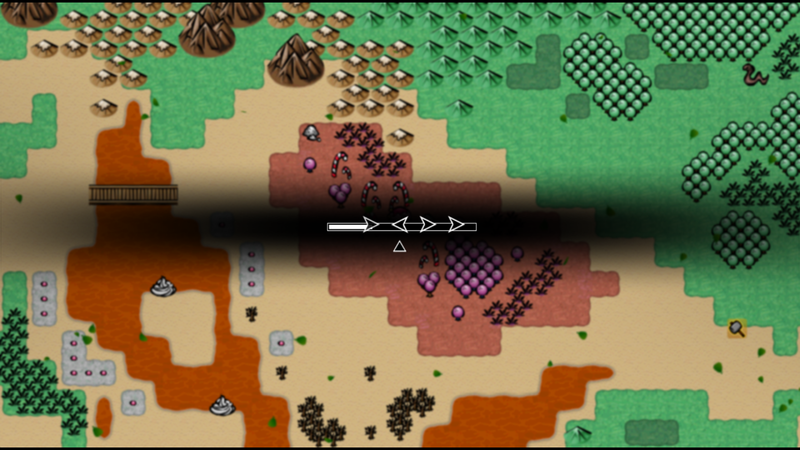 The gameplay consists of building simulation fare as well as rpgs and on-map interactions. 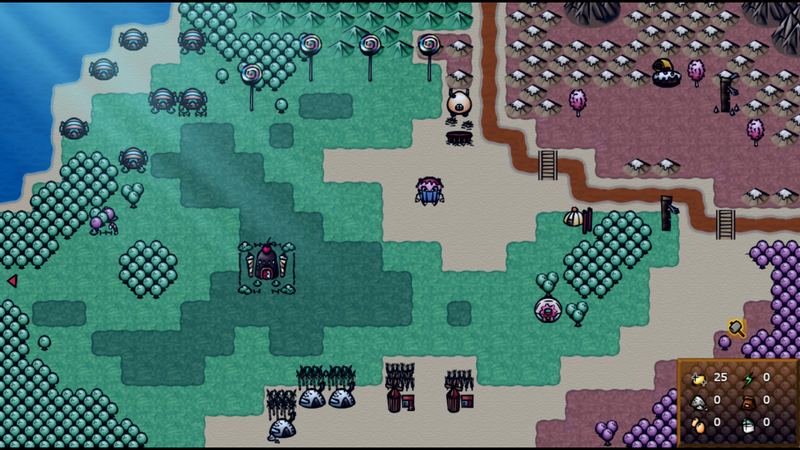 The aim of the game is to build a town and get enough resources together to make a palace for the princess, whilst fending off attacks each day. 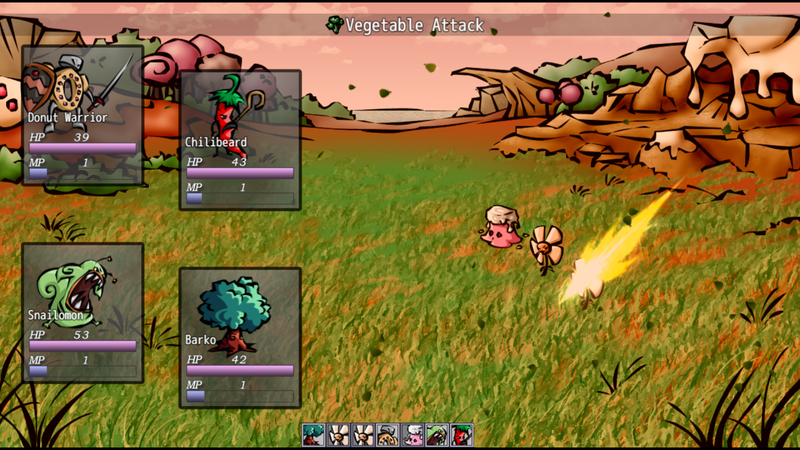 The attacks are presented as jrpg battles and get harder as time goes along. Battles consist of using skills that unlock after a certain amount of MP is obtained, with MP building up each turn. You then go to an area to explore where you can find randomly generated resources to pick up - after playing a combination minigame where you need to input certain key presses before time runs out. You can hire allies with the use of a certain building and they can help you in battle. There's also some equipment you can use if you find it in the exploration area and there's other items you can find that give you a boost in battle. In tutorial mode if you die whilst exploring you get sent back to an empty town that has been reset or losing buildings that were built - understandable if it were death during an attack on the town but not when exploring. On the one hand I enjoyed the sim building aspect of this, but on the other hand it's hard to find resources sometimes and the key input minigame is annoying when you get it wrong since you don't get anything from it. I'd much rather it give you 1 item when you get it wrong and, say, 2-4 if you get it right. The exploration map was also a mess to check out with inconsistencies when it came to what can and cannot be walked on. I liked the building, I didn't like the exploration. The theme was 'build' and it worked. 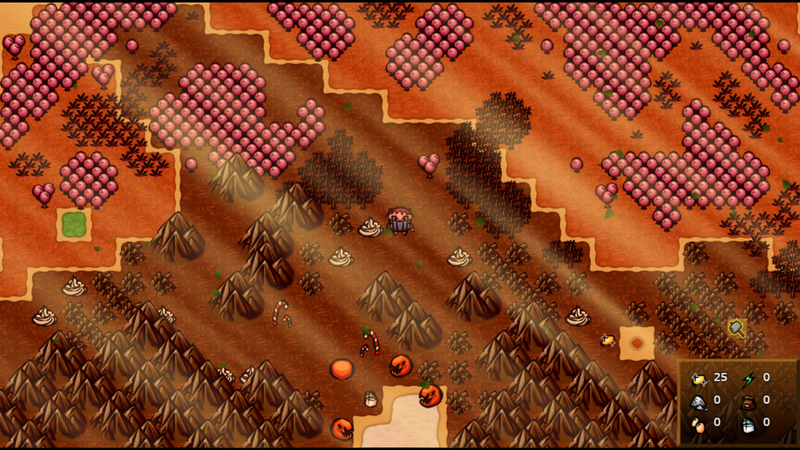 Get resources, build buildings, grow town, fight off enemies - it all followed the theme relatively well. Delightful! I'm not very skilled at it yet, but I'll be coming back to this to try to get that palace built. This was really unique! I haven't seen a game like this made in any RPGM software...well, ever! I thought it was really fun for awhile but I tend to get bored of games like this pretty quickly - you can tell you put a lot of effort into making everything as interactive as possible though, which I love. Really great job!